We’ve just released our second alpha trading card and the third is just about ready for the presses. 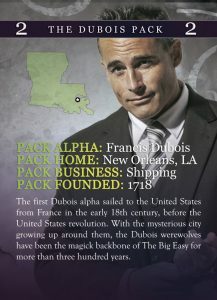 Here’s Francis Dubois, from the first books of the Moonbound Series, and if you’d like to begin collecting the cards, click here! My name is Gina Silva and I have a blog called Gina’s Whims. It’s mostly my attempt to deal with being on disability, having bipolar, and dealing with being a diabetic. I want to try and create tutorials for crafts that I want to sell on Etsy and Ebay but my camera skills aren’t there yet. I horde books like a dragon hordes treasure and would like to include book reviews on my blog. I have read one of your books and would like to post the image and blurb along with my review on my blog. I’ve done some research and thought it best to ask for permission before posting any images. The book I would like permission to post is The Werewolf Cowboy and the back blurb. 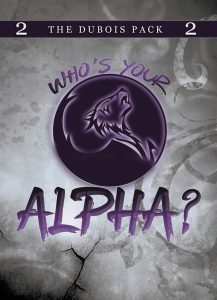 I am going to also post my review on GoodReads and Amazon and will email you links if you would like. Please feel free to post the cover, Gina. Thank you so much for asking.